Tegan and Tess, running free in a limited area a few months after I brought them home. It's a guinea pig story so I should probably start at the beginning. I brought Tegan and Tessera home on Friday, 14 September 2001. I had been companion-animal-less for almost a year and had taken to visiting the pet store every once in a while, just to look. And that afternoon there were only two guinea pigs left in the guinea pig area. One was hiding in an igloo, the other, soon-to-be Tess, was out and I thought her pink ears were so cute. I left, only to pull out Adric's old home and get it ready for newcomers. 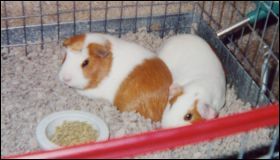 SO drove me back to the pet store and I told them I wanted both guinea pigs. And I was surprised and delighted when I saw the other guinea pig, soon-to-be Tegan, had a rosette on her forehead, Just like Adric! Tess of the pink ears. She is what we lovingly refer to as "high-strung". She is nervous about everything, but very food motivated. Likes to run. Likes to hide. She loves to play tent with newspapers. Tegan with the crest. She is more outgoing and bold. Easy going, but doesn't like to be held for very long, she likes to be Free. The T. girls live in a small wire cage, with a solid bottom. Smaller than the recommended 2 square feet per piggy, but they don't fight and they get floor time, so I've not had a problem, yet. Guinea pig cages must have a solid bottom, not wire like rabbit cages, because guinea pig's small feet can get caught in the wires. Most of the time they are on CareFresh bedding, which is recycled paper pulp. Never bed small animals with cedar shavings, the essential oils are dangerous to lungs and liver, pine shavings are iffy that way too. 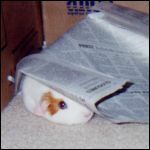 The paper pulp is ideal, but fairly expensive for guinea pigs because they go through lots of water and the entire bedding must be changed daily. I go through a 20$ bag of CareFresh in about 2 or 3 weeks. yikes! So, lately, I've been shredding newspapers for bedding and that seems to work pretty good, too. The guinea pigs get guinea pig food, of course. I use Nutriphase and a 10 pound bag is 8$ and lasts about two months. They both love the flavored bits that are mixed in, and I have to pick those out and feed them as treats, otherwise Tess will dump the entire dish of food, looking for the yummy bits. They get a slice of orange about every day. It's very important to feed your guinea pigs oranges. Humans and guinea pigs are the only animals who cannot synthesize their own Vitamin C. Even if you feed a guinea pig food that says it's fortified with Vitamin C, you still need to feed them oranges as well. This is because Vitamin C breaks down very quickly and the piggies probably won't get what they need from the fortified food. I made this mistake with my first guinea pig, Adric, and there was much worry and several vet trips. Nail trims every month. These girls have clear nails, much easier to see where to cut than Adric's black nails. T and T don't much like trims, but it's a necessity and they've definitely gotten better about the process. I usually take them into the bathroom, the strange room kind of intimidates them into holding still. I hold them on my lap and trim with a regular human nail trimmer. You should trim just beyond the "quick" which is a blood vessel running through the nail. There are nerves in there as well, so sometimes they will squeek, even if you're doing a good job. If you get too far up, you'll hit the blood vessel and they will bleed. This isn't the end of the world, but it does hurt, so try to be careful when trimming your critters. It's handy to have stiptic power on hand which will stop the bleeding, you can buy this stuff at pet stores. For treats, my girls love frozen peas. Just the right size! and nutritious, to boot. :) They also enjoy munching on the fruit and nut logs from the pet store, kind of messy, tho. 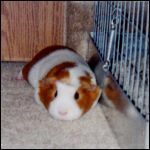 And for fun, the guinea pig girls like to run around on the floor. Guinea pig proof the room! I block off the computer area, because I don't want them chewing on the cables there. And lay down newspapers in their pee areas. They are paper trained for urination, at least. They poo all over the place, but no big deal, just let the pellets dry and vacuum them up. I have taught both Tegan and Tess to climb up into my hand to be let out. Tegan is an old pro at this move, climbing up just as soon as I offer. Tess still needs some encouragement, treats to lead her up my arm. Phew, lots of typing. Nap Time.